We make sense of health care regulations for small business owners. The Affordable Care Act, which is commonly known as Obama Care, refers to the health insurance reforms that started in 2010, and will continue to progress through the next few years and beyond. The variety of provisions in the Affordable Care Act have reformed the insurance market, and encouraged small businesses to offer affordable health insurance. Different requirements of the Affordable Care Act apply to self-employed businesses, employers with more than 50 employees, employers with less than 50 employees, and employers with less than 25 employees. It is important to be aware of the requirements so that your business can constantly remain in compliance. For example, businesses with less than 50 full-time, or equivalent, employees are exempt from penalties if they do not offer coverage, though they may qualify for employer health care tax credits. Our payroll services ensure that you are, and remain, in compliance throughout the growth and development of your company. This is especially important if you are close to reaching 50 full-time employees. You, as an employer, will need to monitor your workforce so that you can act accordingly when you reach the threshold. If you surpass the 50 full-time equivalent employees mark, and you do not offer or change your healthcare coverage, you could end up facing steep penalties. 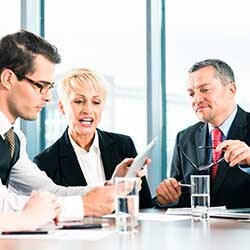 When a business reaches 50 or more full-time equivalent employees, they are considered a “large business”, and no longer a “small business”, so they are then required to offer employee healthcare coverage or face a hefty penalty. Large business employers are also required to report to the IRS on all employee health coverage offered and not offered. iPay Payroll Solutions will keep you up-to-date with the latest numerous provisions from the Affordable Care Act so that you don’t have to.